The primary focus of the activities at St. Innocent Church is Divine Worship. Since to know God is to worship Him, the liturgical life of worship and prayer — celebrating the liturgical cycle as fully as possible — is the central activity at St. Innocent. The parish seeks to grow, and desires new members who yearn to worship God in the fullness of the Orthodox Tradition, including attending the full cycle of Divine Services. Also desired are new members and non-Orthodox inquirers, who are eager to learn about the Orthodox Faith and participate in educational programs. Classes or private instruction are available to all who are interested, including special instruction for families who may wish to become Orthodox. In addition to the regular weekly Sunday School for young children, St. Innocent Church also conducts Family Education Class for adults and teens as needed, and has conducted special Reader's Instruction for those interested in serving Christ's Holy Church as a Reader. Other parish activities involve parishioners participating in activities outside the parish, but on behalf of the parish, including participating in: COCC (Council of Orthodox Christian Churches of Metro-Detroit); the Inter-Orthodox Choir activities; the Annual COCC Inter-Orthodox Lenten Vespers series; Services, activities and educational programs at, and in conjunction with, sister Orthodox churches and monasteries; and the activities and programs of the Orthodox Christian Women of Michigan (OCW), which was founded at St. Innocent Church by a St. Innocent parishioner in February 1993. The parish also has periodic drives for food and clothing for the needy. In the Spring of 2005 the St. Innocent Youth Group started what will be an always continuing project of collecting empty refundable bottles and cans and sending the refunded money to the St. Innocent Orthodox Orphanage for Boys in Mexico, the IOCC or other Orthodox charity. On 7 October 2018, we were blessed with a visit from the Miracleworking and Myrrh-streaming Hawaiian Iveron Icon of the Theotokos! 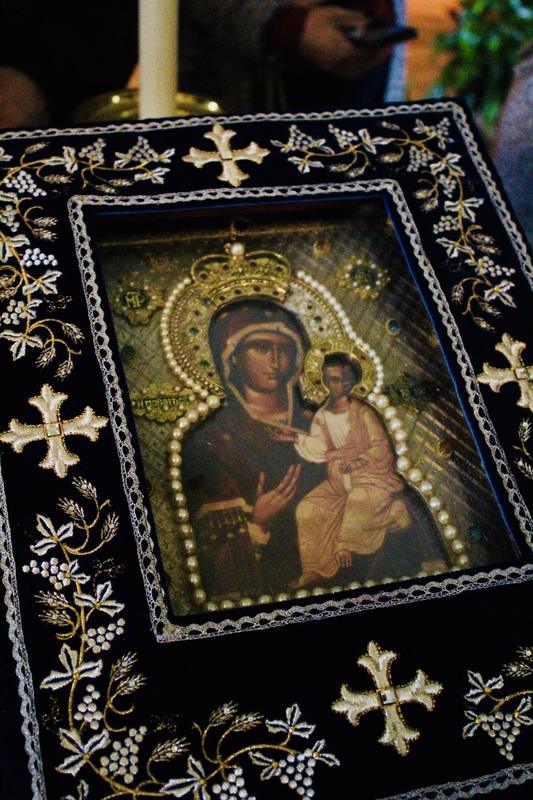 "From thy Holy Icon, O Lady Theotokos, blessed myrrh has flowed abundantly. Thou hast thereby consoled those, in exile, faithful unto thee, and hast enlighten the unbelievers by thy Son's light. Therefore O Lady, with tears we bow down to thee. Be merciful to us in the hour of judgment. Lest having received thy mercy we be punished as those who have been contemptuous of it. But grant us through thy prayers to bring forth spiritual fruit, and save our souls" - Troparion to the Iveron Icon, Tone 7.